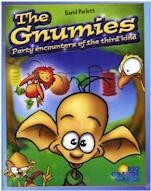 When there's a party on the planet Gnum, everyone wants to come: the Dimmlings, Dancemites, the Happy Herbies and the Dumbballs. But, if the guest list includes a Wullawaki, then other guest, like the Grovellor or the Rapster may leave the party. In the end, everyone has a good time at the party, but the player who gets the coolest guest at his party wins the game!.